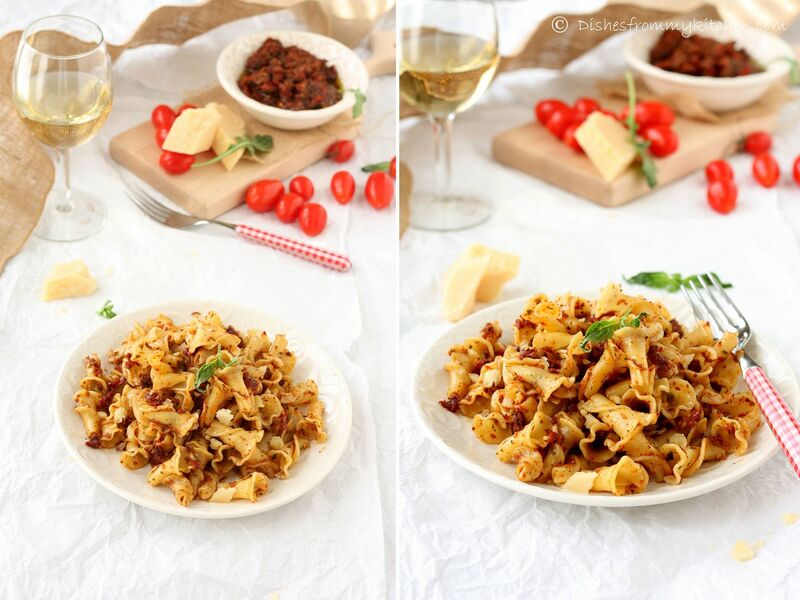 Dishesfrommykitchen: SUNDRIED TOMATO PESTO PASTA ! 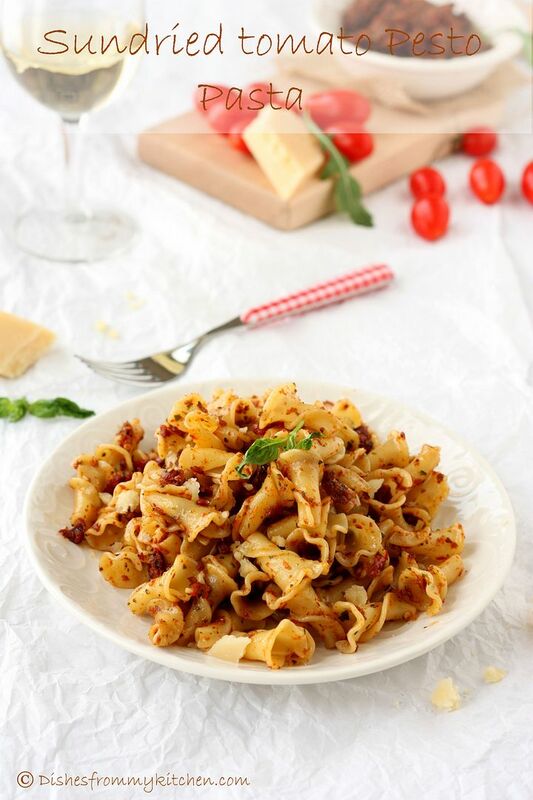 Here is a quick pasta dinner which can be made in no time, if you have sun-dried tomato pesto handy. 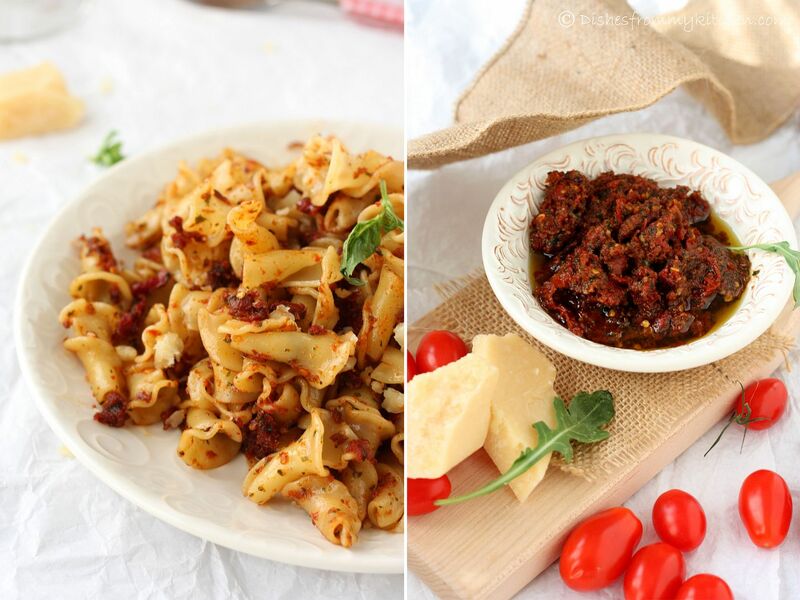 I love anything made of sun-dried tomato. 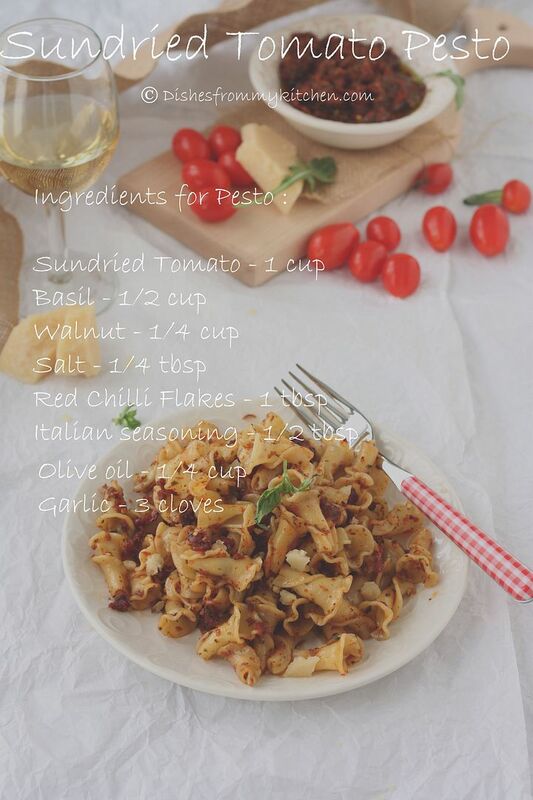 More than creamy pasta I always love this kind of low fat versions of pasta. 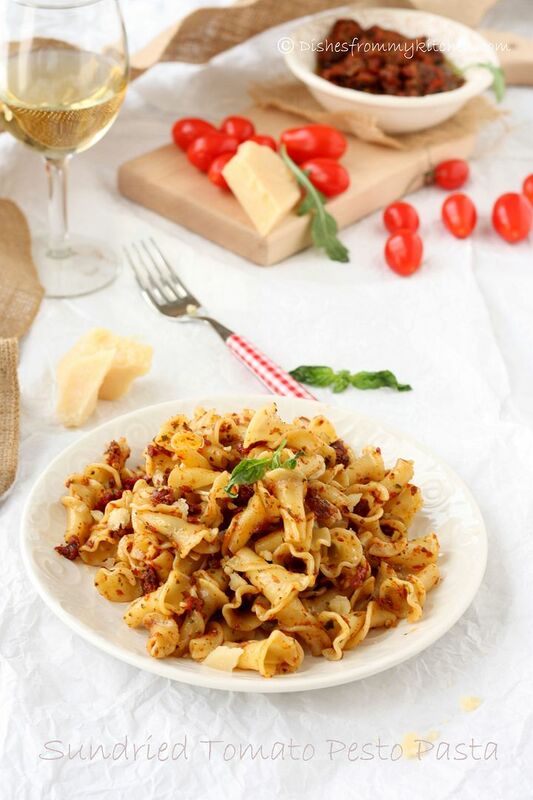 Even though I make this very often this time it was so special, yes because of the fruity Olive oil, juicy sun-dried tomato packed with olive oil and herbs are all from Italy. 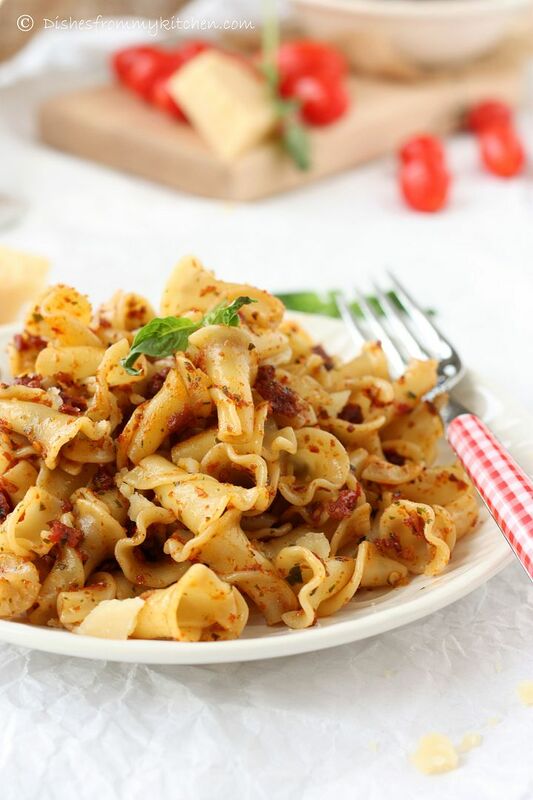 The pasta was so flavorful and we enjoyed it to the core. It was absolutely delicious and light. 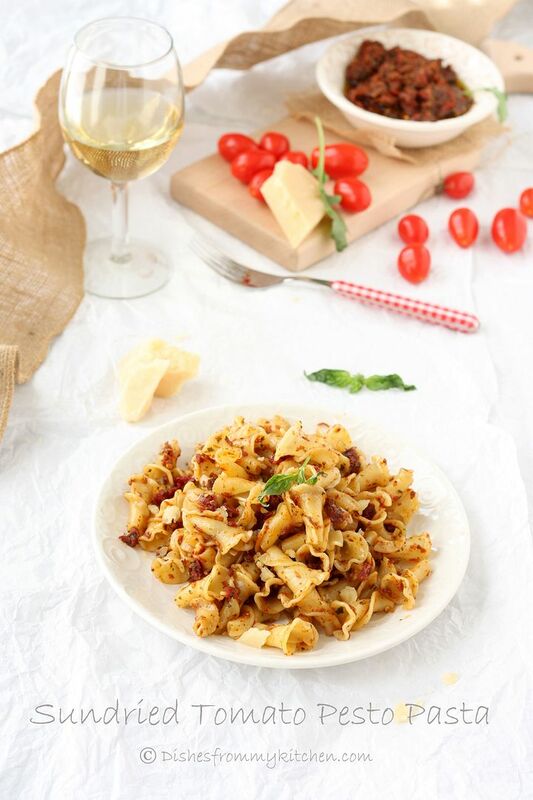 Enjoy Sun-dried tomato pesto pasta with your favorite wine!!! Do take a look MY TRIP TO ITALY PART I and stay tuned for more parts :) Yes I am taking my own (lazy) time to post about my trip. Also stay tuned for recipes I came across during my trip. 1. 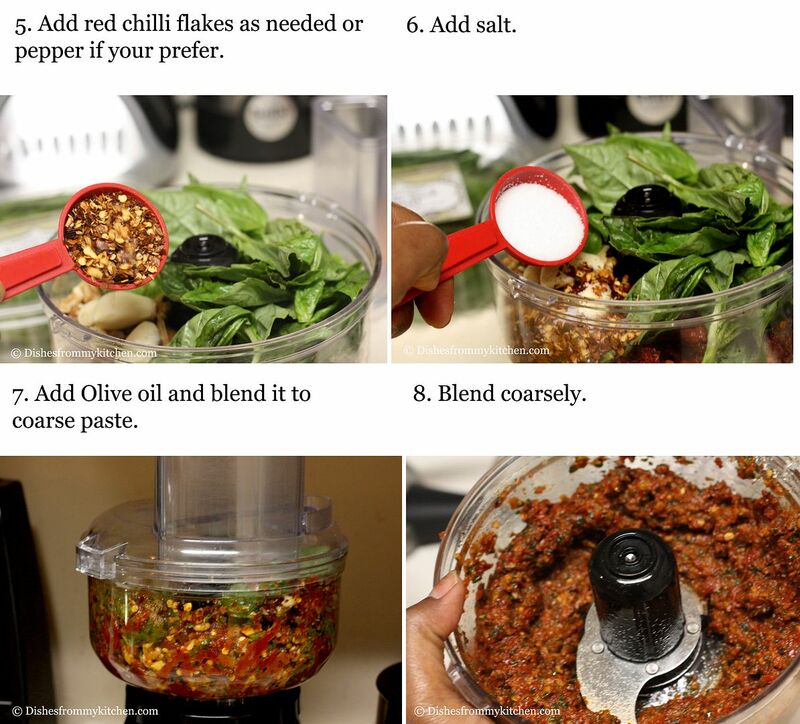 Blend all the above ingredients in the food processor and store it in the air tight container. 2. Refrigerate and use when needed. 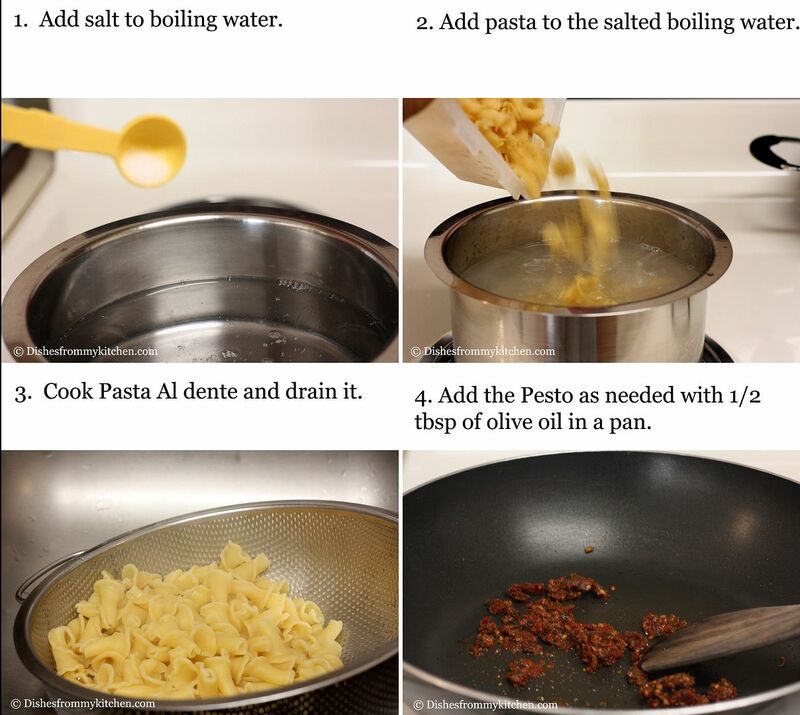 Serve hot with Parmigiano reggiano and Garnish with Parsley or basil !!! Enjoy !!! your pesto looks sooo good !! love this simple dinner dish ! 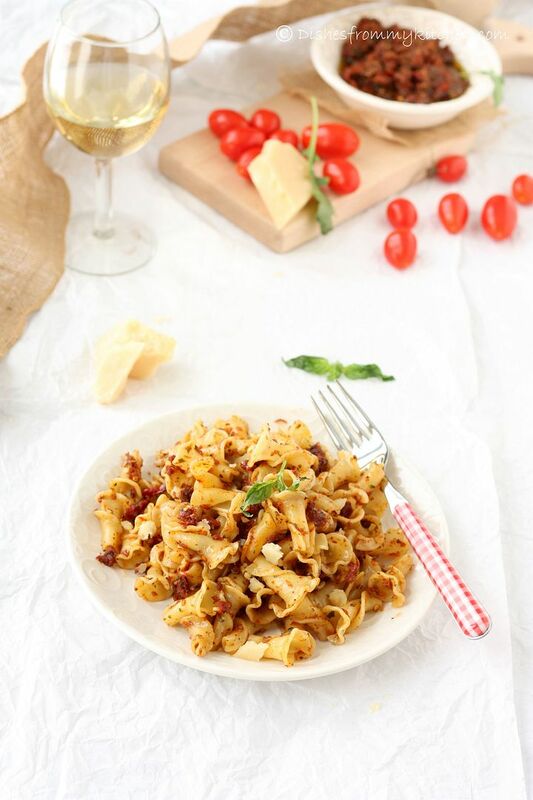 simple n easy pasta.. different and interesting! 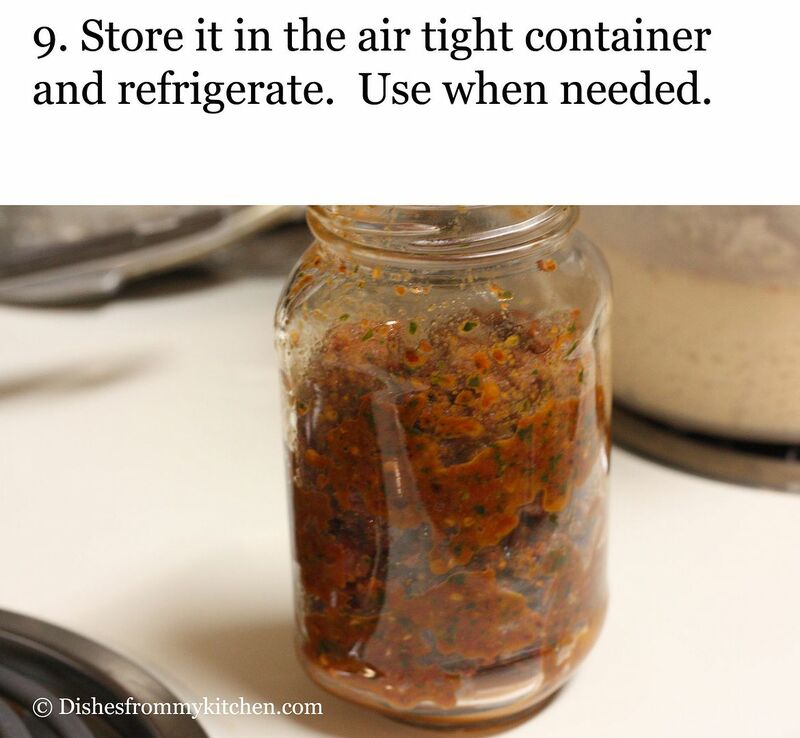 love sun dried tomatoes. i can use that pesto in bread and call it a day. Wow! Look at the color I love these combination of ingredients..
Looks beautiful Pavithra. 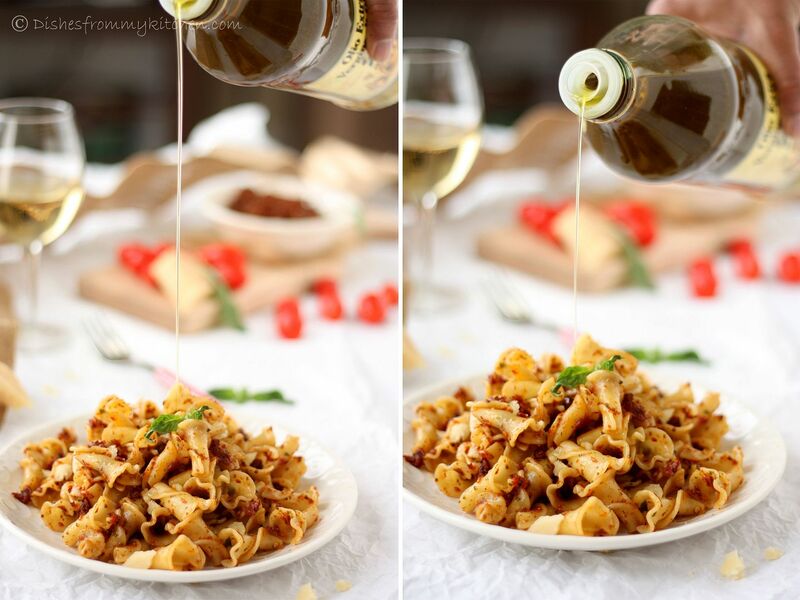 Love the click of the olive oil pouring down! Wonderful dish Pavi, I would love this with some more veggies added. Such a lovely pasta dish. Wonderful clicks! 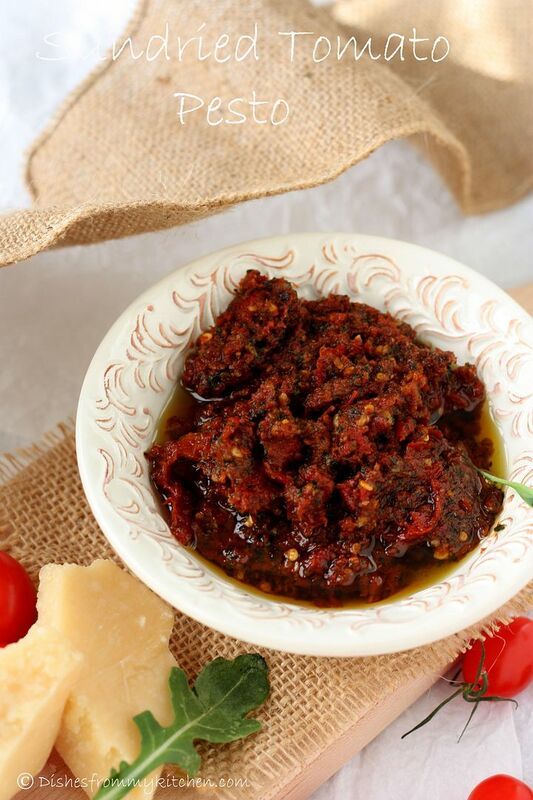 Sundried tomato pesto,yumm..Simply love this pesto very much. Absolutely Gorgeous looking pesto - I love SD tomatoes too and add it all the time to pasta. Nanda refuses to eat if he does not see them! Im bookmarking this to make it sometime soon. Thanks Pavi! You need to call this dish 'make you swoon and go weak in the knees' pesto.. 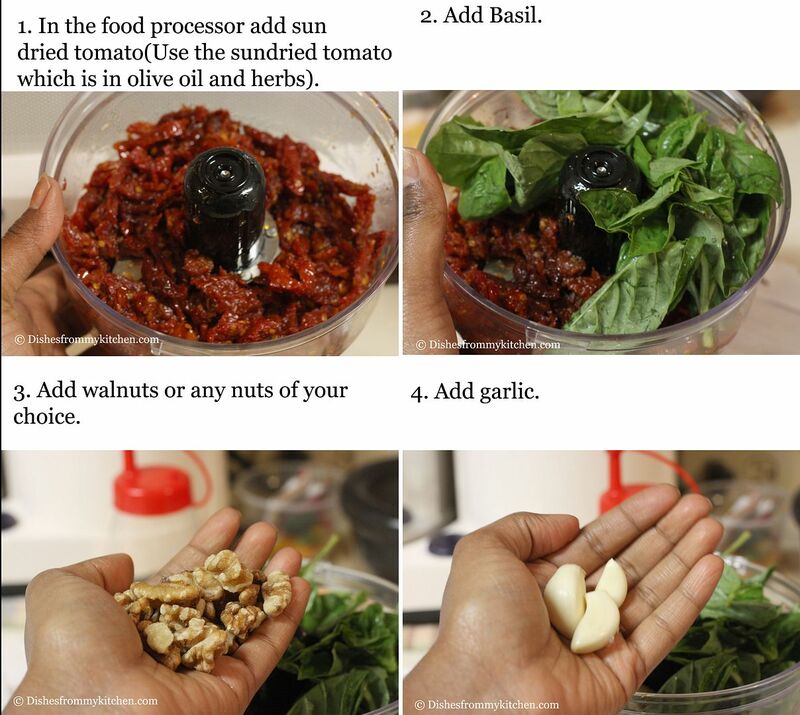 I love sundried tomatoes and that pesto looks really good. I look forward to the rest of your trip photos. Thanks for sharing this usable article - I really increase your acquisition.it is really very informative post for young people, and hope they will enjoy well after reading this post.